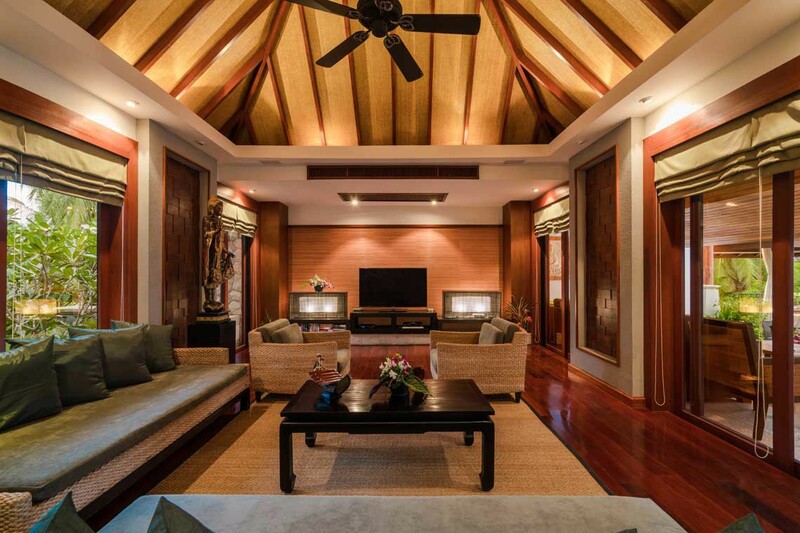 This Luxury Phuket Villa Rental is absolutely stunning and is available for short or long term holiday packages, villa weddings or family gatherings. 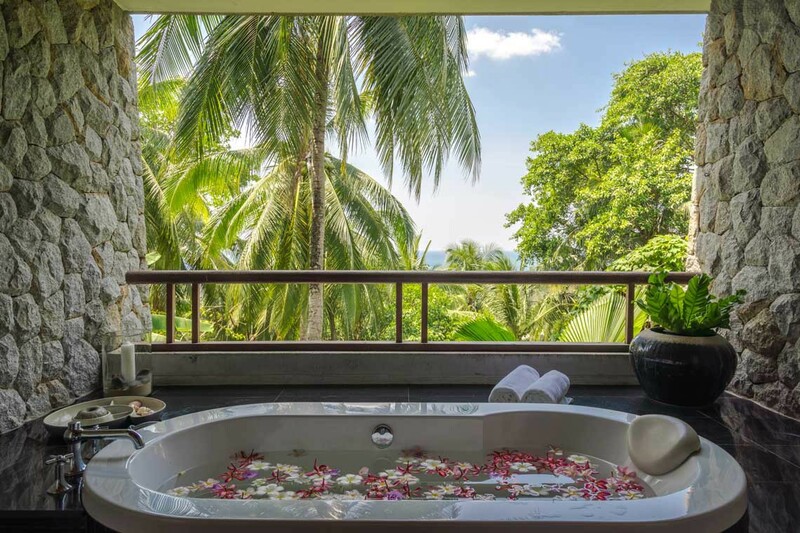 Villa Sanyanga is perfect for families, couples or a group of friends travelling together, providing the privacy and seclusion of a Phuket villa rental, and the personalised service of a high end five star luxury resort. 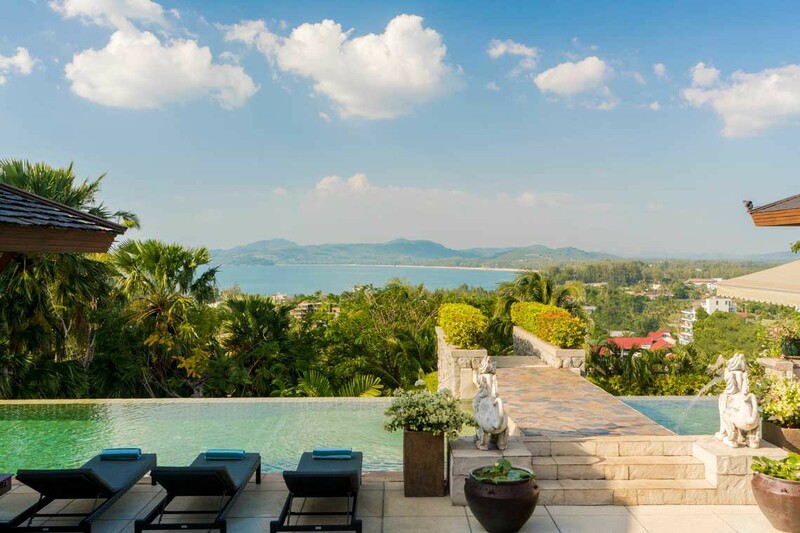 The villa is set high on a hill overlooking Surin and Bangtao beaches on the west coast of Phuket. 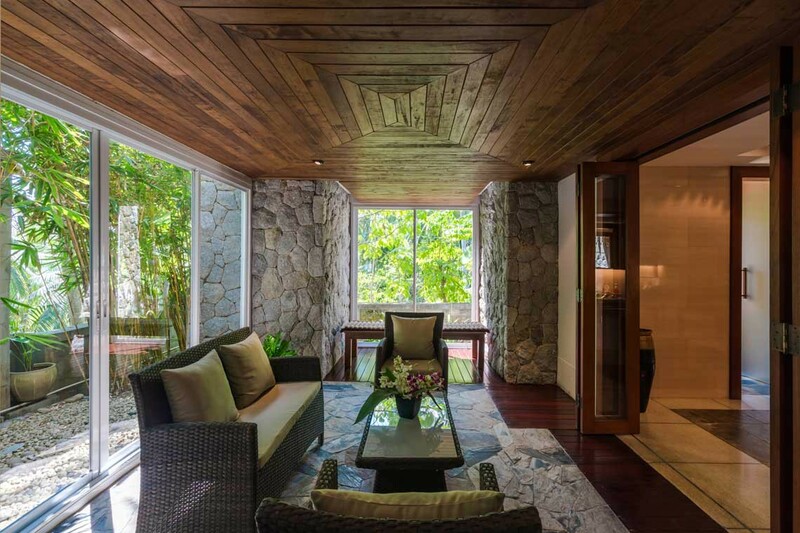 Recently we were given the opportunity to inspect Villa Sanyanga, a luxury seven bedroom villa, built over three levels, located within a private estate just 5 minutes from the beautiful Surin Beach. 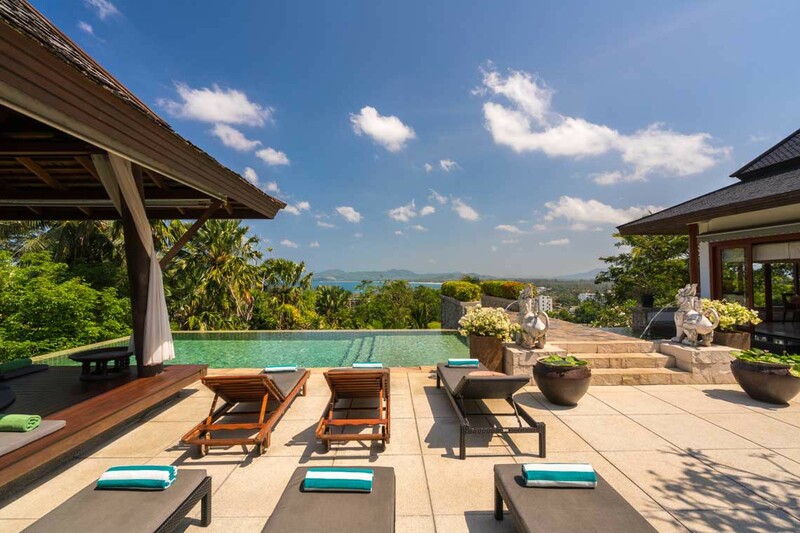 Villa Sanyanga is undoubtedly one of the finest luxury Phuket villa rentals on the island; the villa is spacious and well-appointed featuring an infinity swimming pool and swim up bar with beautiful ocean views. 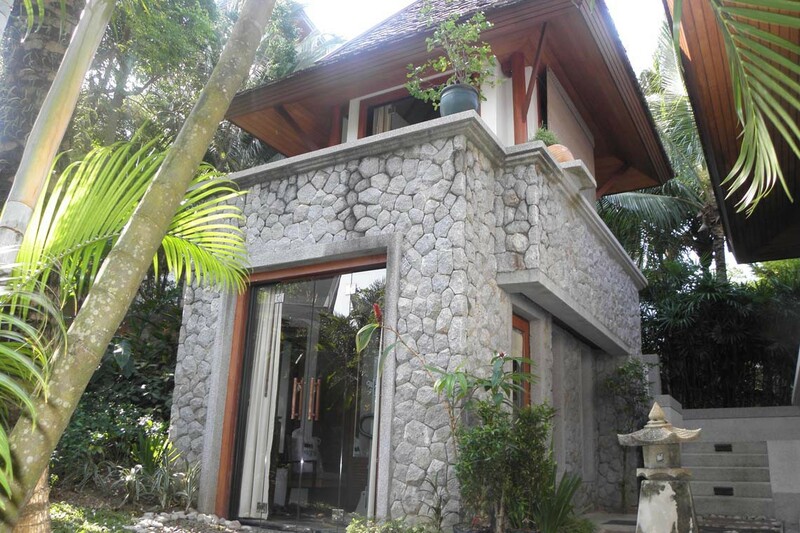 Whilst Villa Sanyanga is a self-catering Phuket villa rental, there is no need to worry about preparing your own meals as there is a full time chef on hand to prepare all your meals, along with three housemaids to ensure that your stay at the villa is first rate. 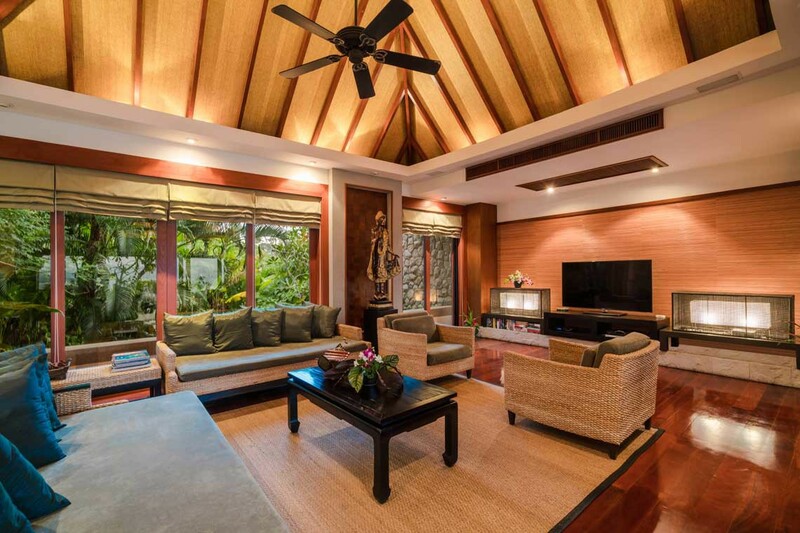 Transport is not an issue at this Phuket villa rental as guests have exclusive use of a 15 seat mini bus which comes complete with your very own driver. 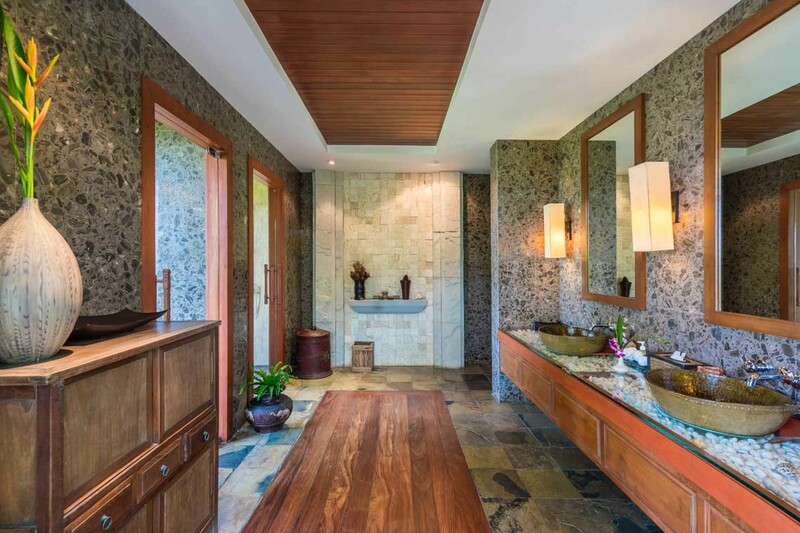 Villa Sanyanga features seven exclusively designed bedrooms and seven private en-suite bathrooms across the villas three levels. 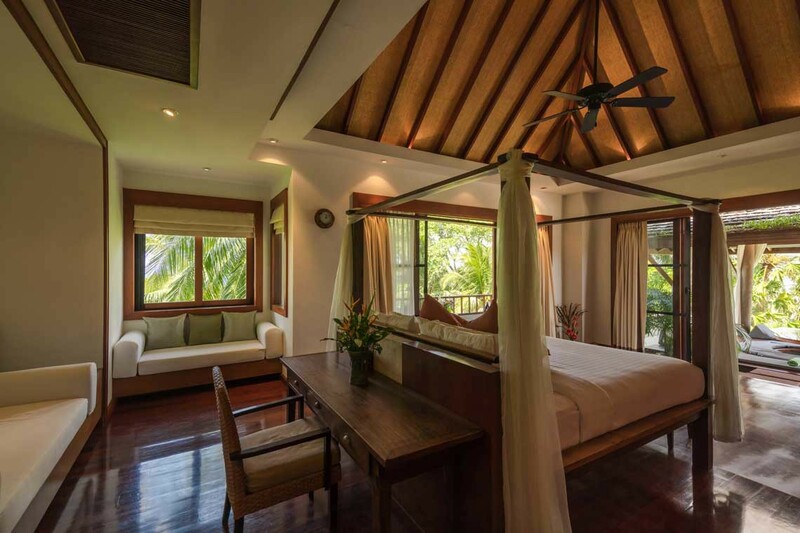 Each bedroom suite delivers guests a luxury private retreat within each suite. 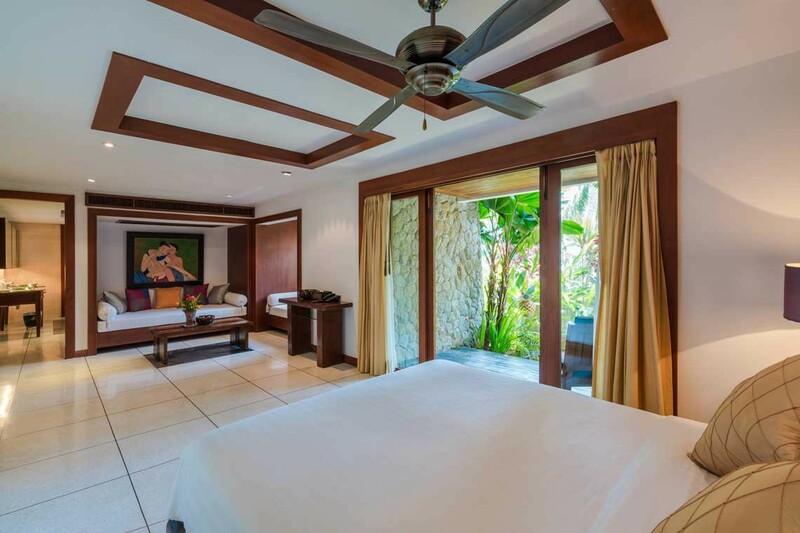 The master bedroom suite is superb, located on the pool terrace level, allowing for direct access to the swimming pool and Thai Sala. 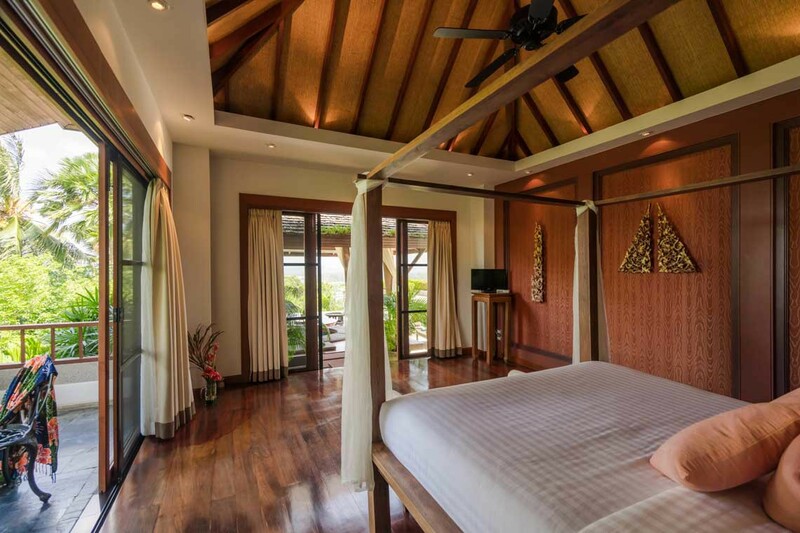 This bedroom is extremely spacious and well-designed, incorporating a generous sized en-suite, a private ocean view terrace and elegantly designed private Jacuzzi. 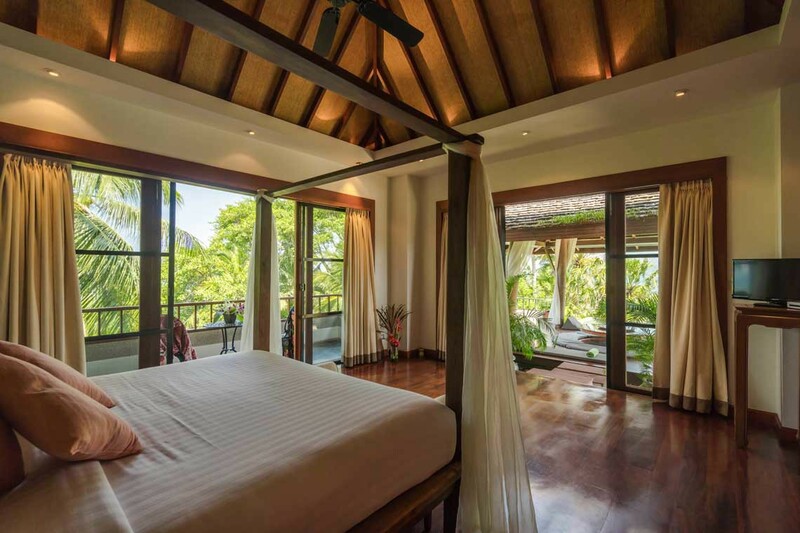 The second bedroom is located on the second level of the villa; this bedroom is absolutely gorgeous, offering guests total privacy. 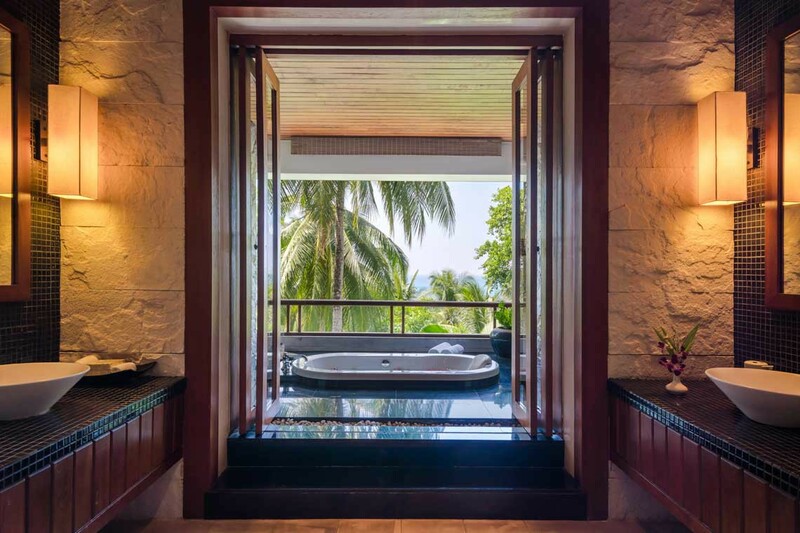 The en-suite is unique; featuring a sunken outdoor bath tub with ocean views. 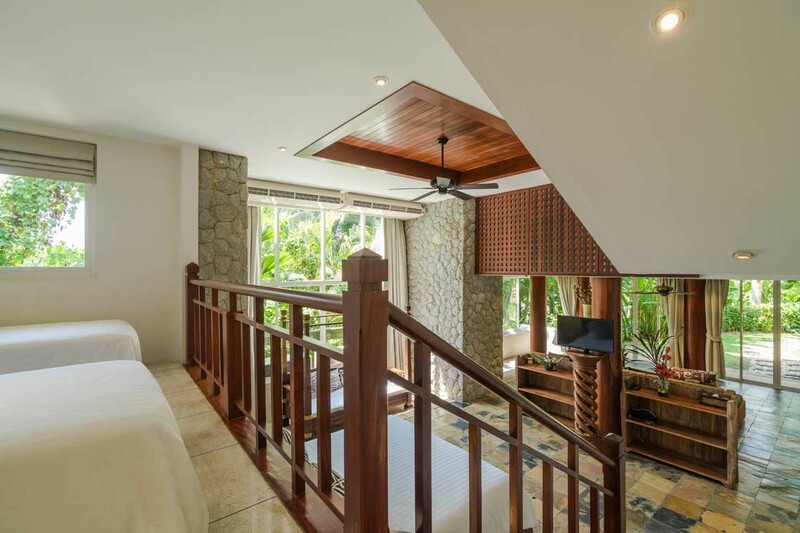 The third bedroom is situated on the second level, with a small private outdoor terrace; there are a couple of stairs that lead from the bedroom to the en-suited bathroom. 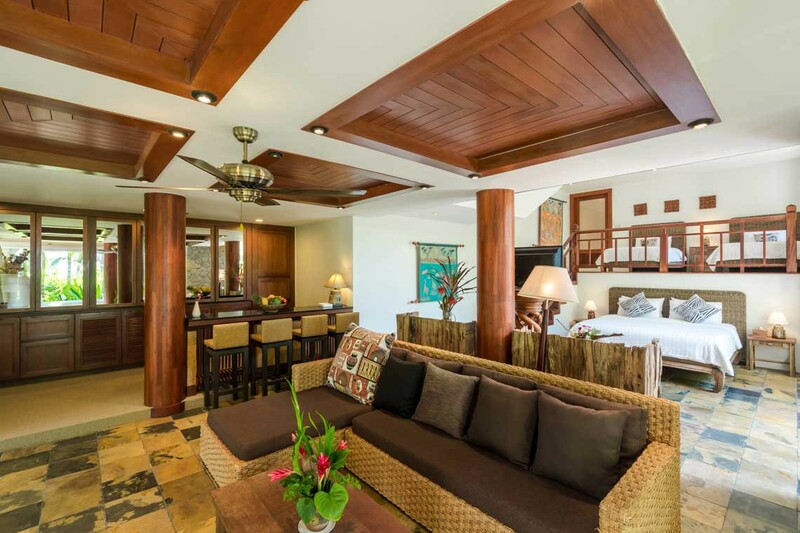 The family room / fourth bedroom is also located on the second floor of the villa featuring its own lounge area with comfy sofas and a television and an en-suited bathroom. 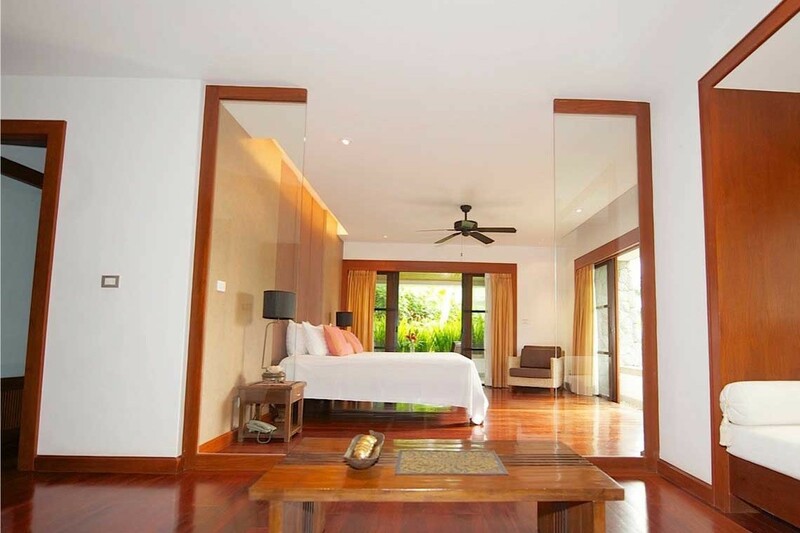 If needed there is access to the third bedroom through the third bedroom en-suite. 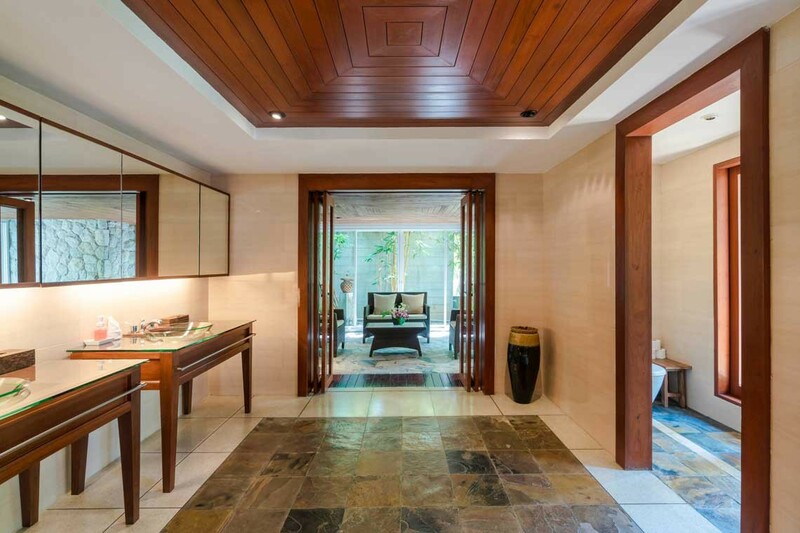 If access is not necessary this door can be locked. 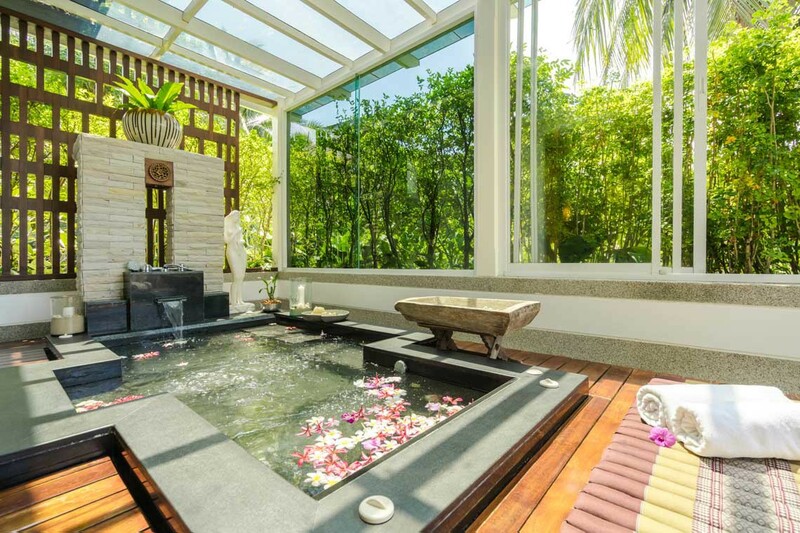 The garden spa suite is situated on the lower level of the villa; this suite comes complete with an indoor garden spa room featuring a massage bench, chair and sofa. 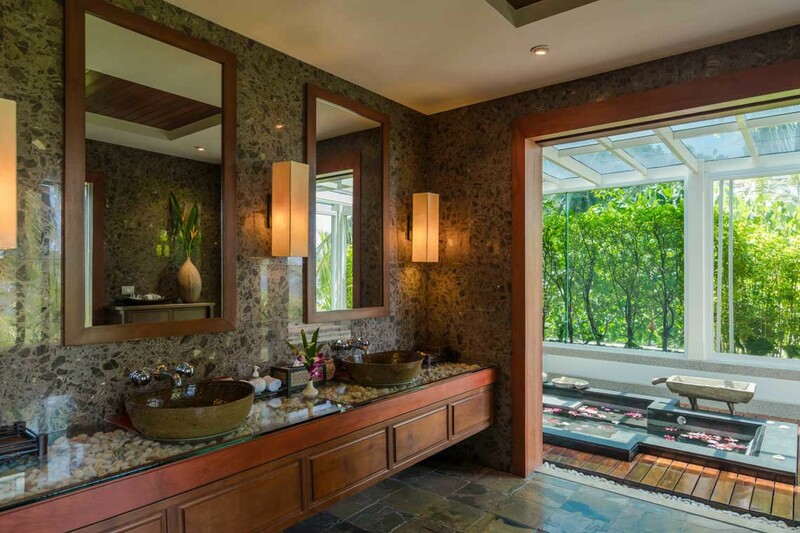 Other features include a large en-suited bathroom, dressing room, a private lounge area and garden terrace. 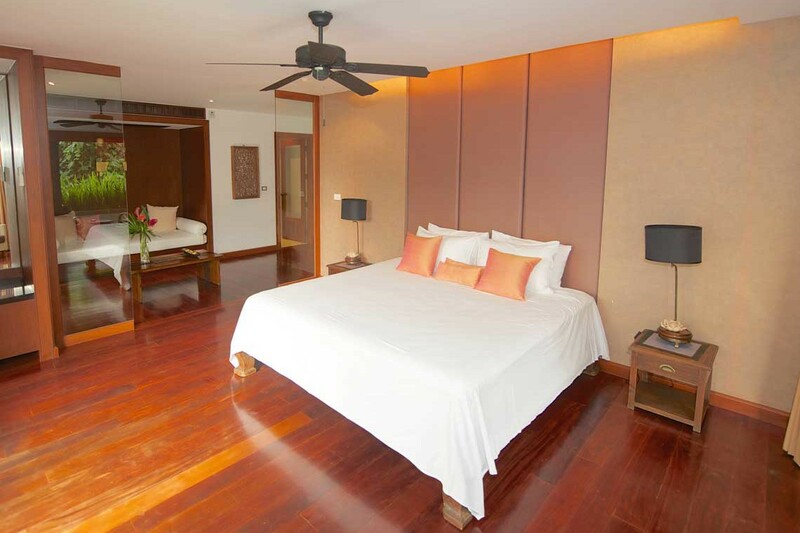 The garden suite is one of my favourite rooms, this room is also located on the lower level of the villa. 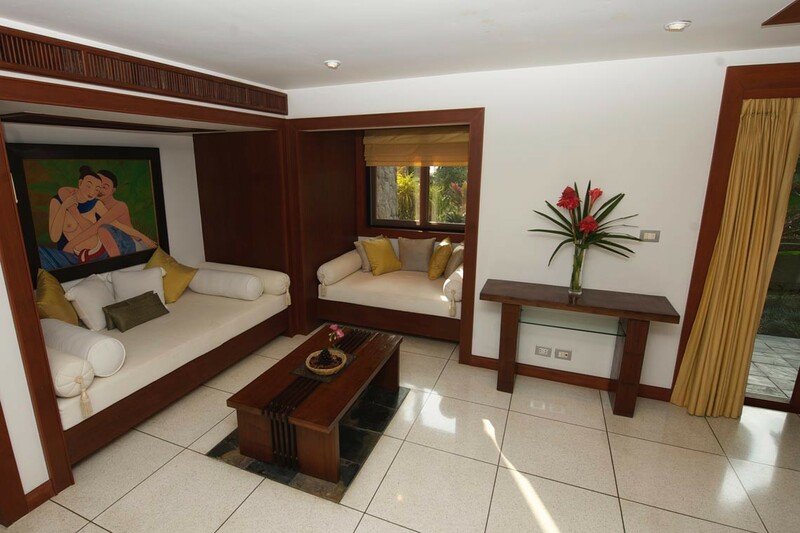 The Garden suite is big enough to be an apartment on its own, spanning over two levels with room to sleep five or six people. 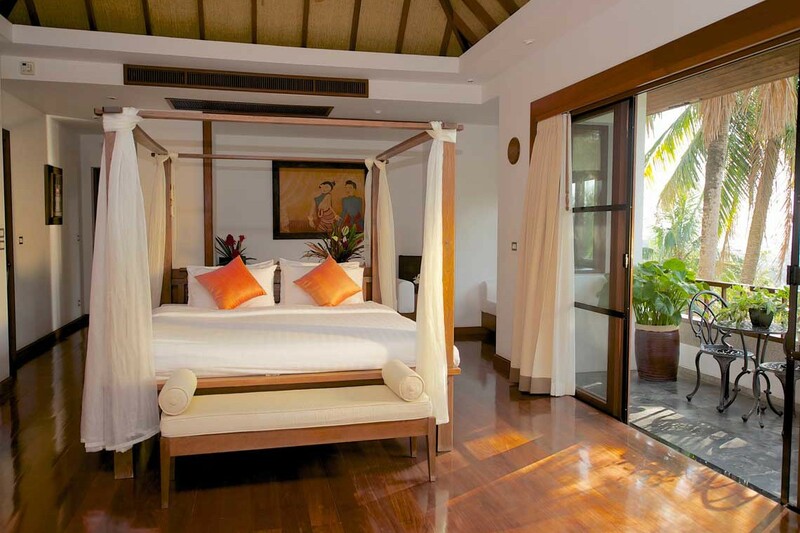 The lower level of the garden suite is open plan featuring a king sized double bed and a single bed. 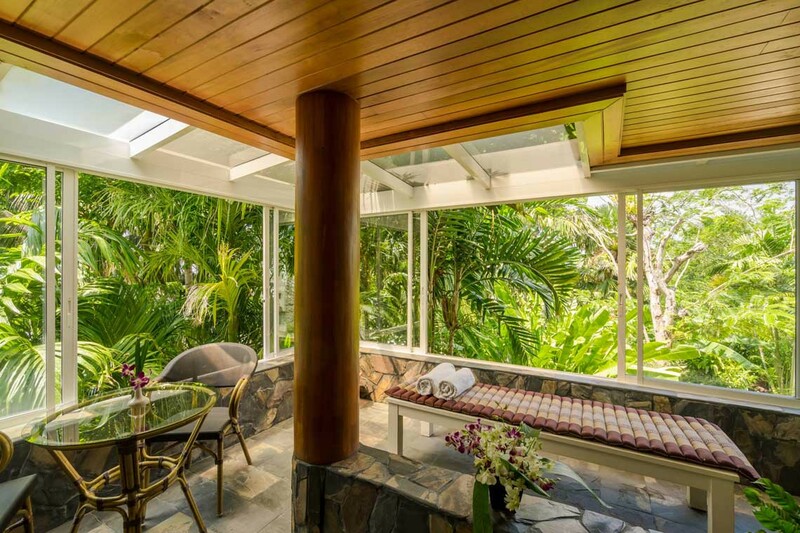 On this level there is also a bar and bar stools, a refrigerator, television and lounge area that looks out over the private terrace and garden. 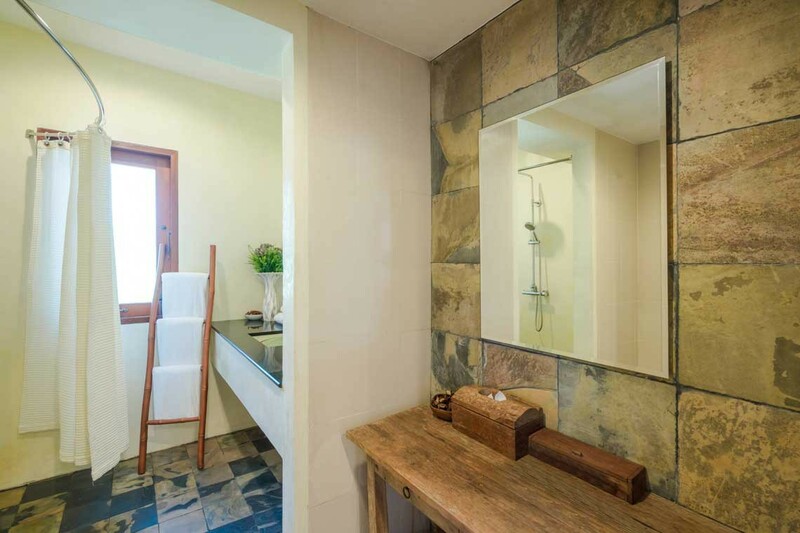 The Garden suite also has it's own private en-suite with dressing room and wardrobes. 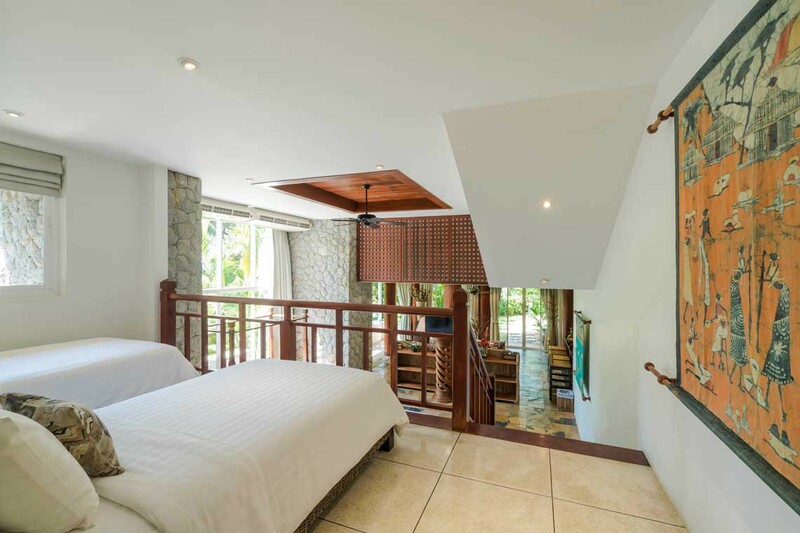 On the mezzanine floor there are a further two single beds. 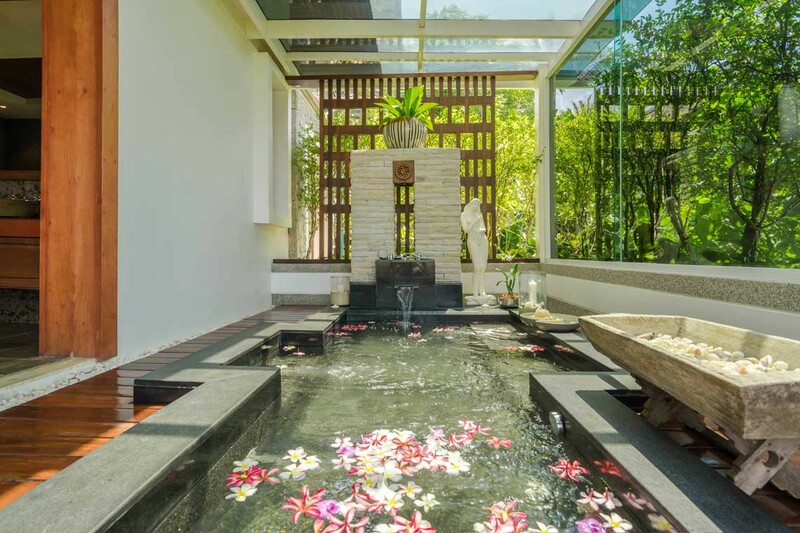 The annexe is a two storey building which stands separate from the main Villa, the annexe is situated on the upper pool terrace. 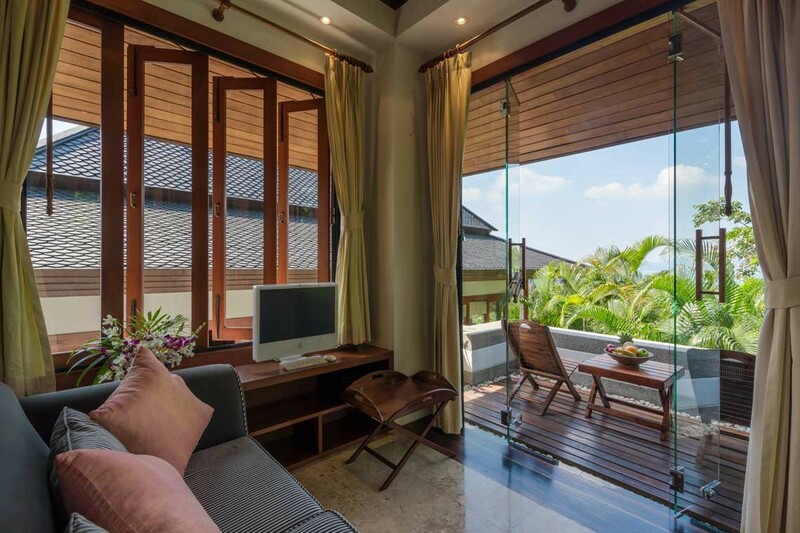 Upstairs is a small living area or study that comes complete with a sofa bed, computer, printer and outdoor terrace which boasts stunning views. 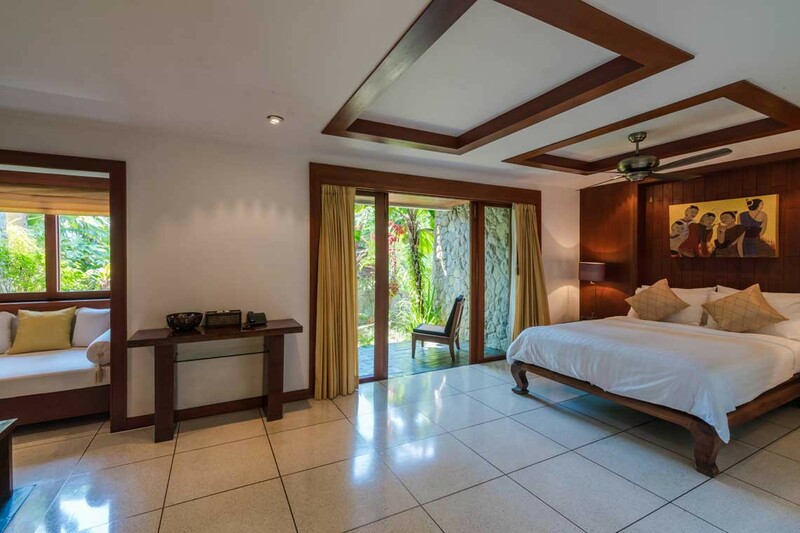 Guests can use this area as an office or if needed it can be converted into an extra bedroom.On the lower level of the annexe is a bedroom, featuring a single bed with en-suited bathroom. 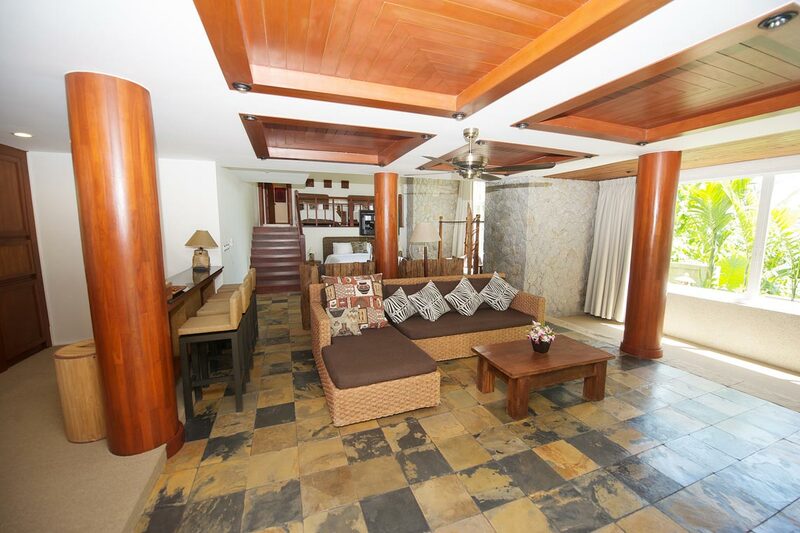 All the living and dining areas are located around the terrace area of the villa well away from any of the bedroom suites. 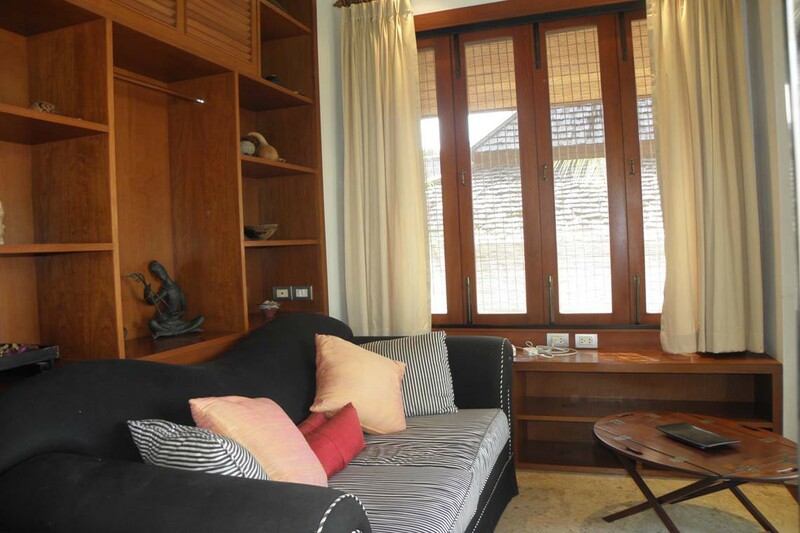 The living room is located above the pool terrace with quality furnishings throughout including comfortable sofas, a coffee table; roman blinds a large flat screen television and DVD player. 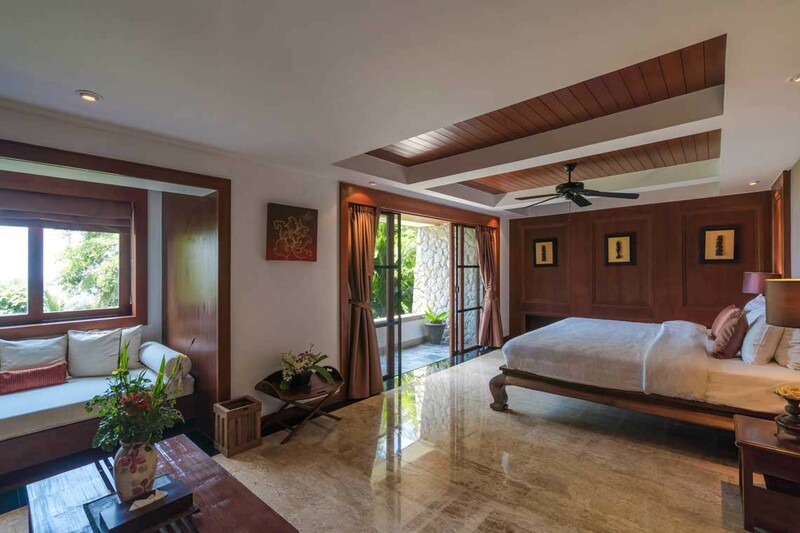 There is also an indoor dining room and gourmet kitchen located in a separate building with French doors that open out to the swimming pool and terrace area. 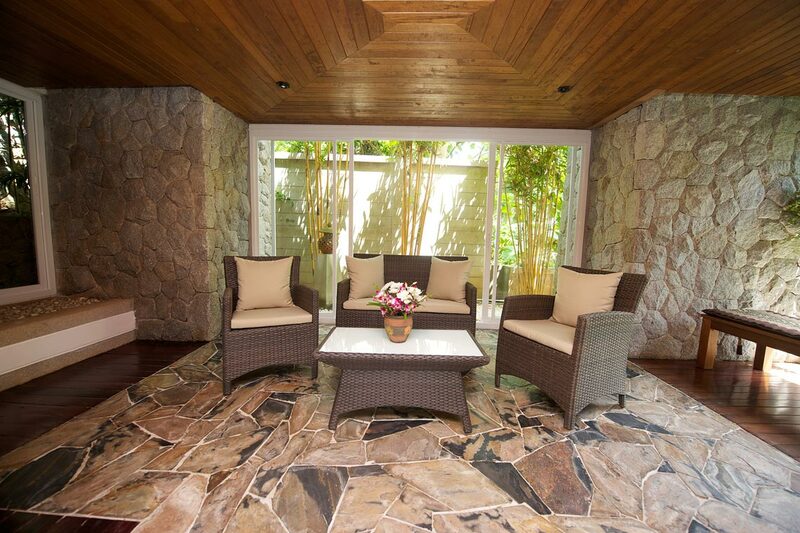 The dining room can seat up to 20 guests. 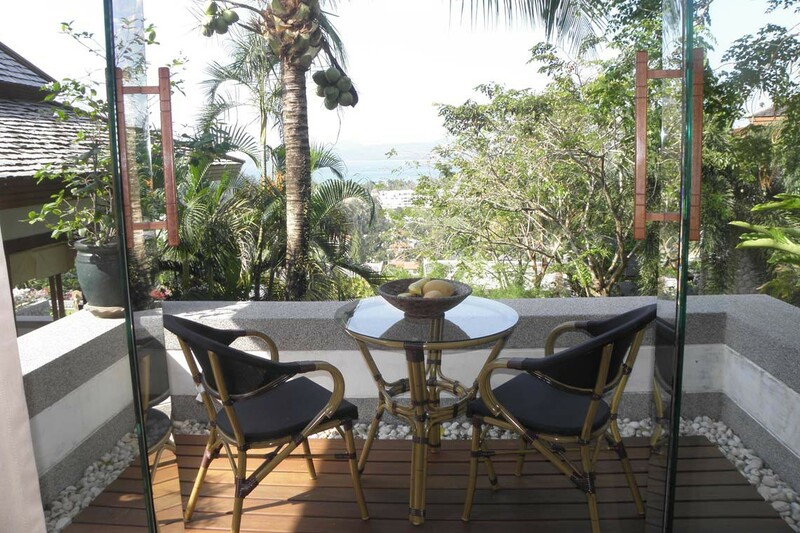 This luxury Phuket villa rental provides guests the choice of two beautiful alfresco dining areas. 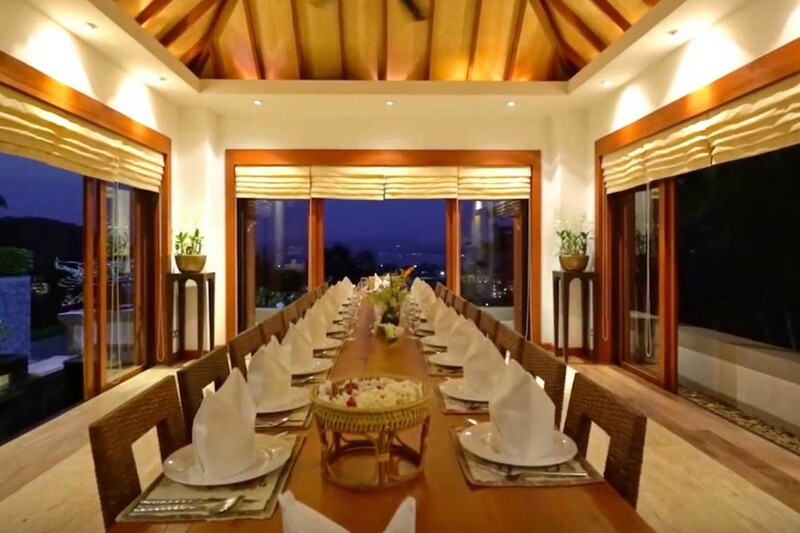 There is a 12 seat dining table situated on the shaded terrace or you can sit underneath the traditional Thai Sala which is located next to the swimming pool, each have magnificent views of Bangtao bay. 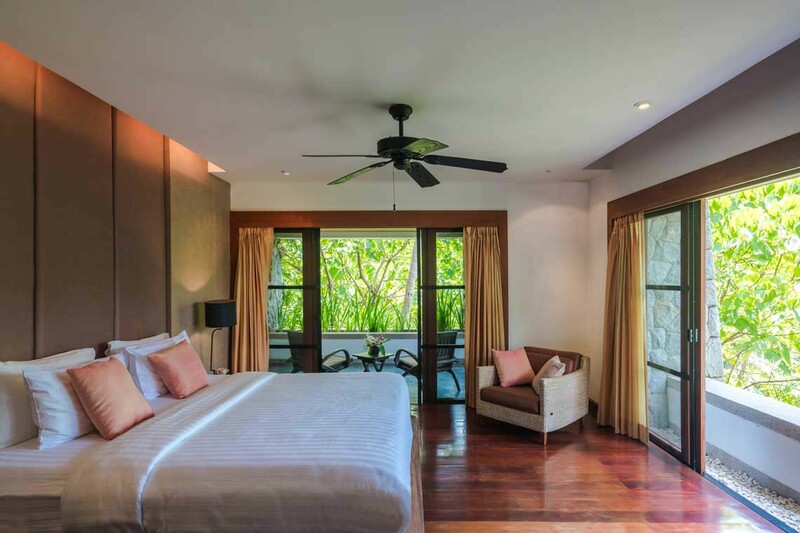 One of the most important aspects to look at when searching for a Phuket Villa rental, is having the facilities that are important for you to enjoy a relaxing holiday. 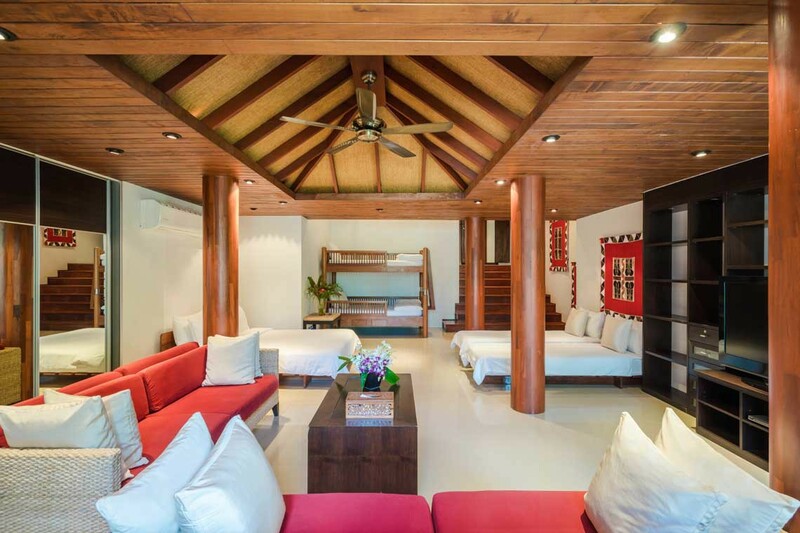 Villa Sanyanga ticks all the boxes for a fun and relaxing holiday in Phuket. 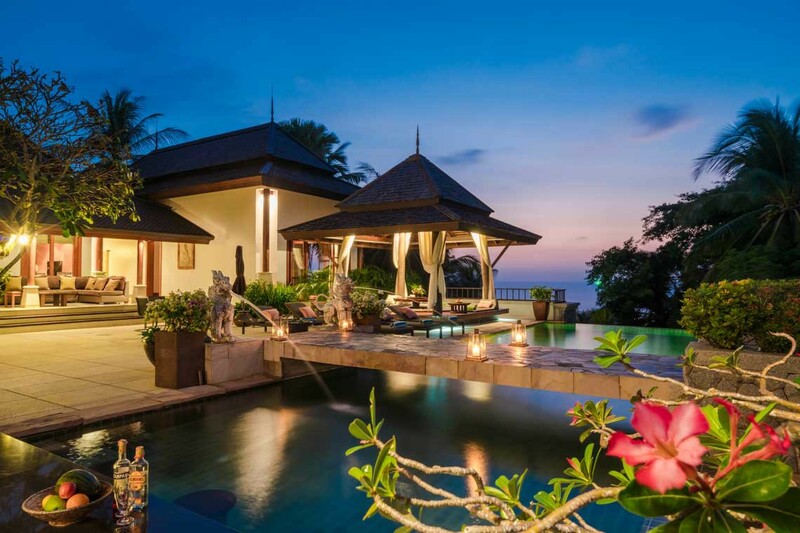 A combined airport transfer is provided to villa guests on arrival and departure. 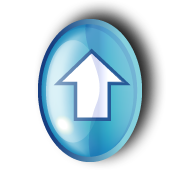 If there are multiple arrivals and departures at different times the staff can arrange extra transfers. 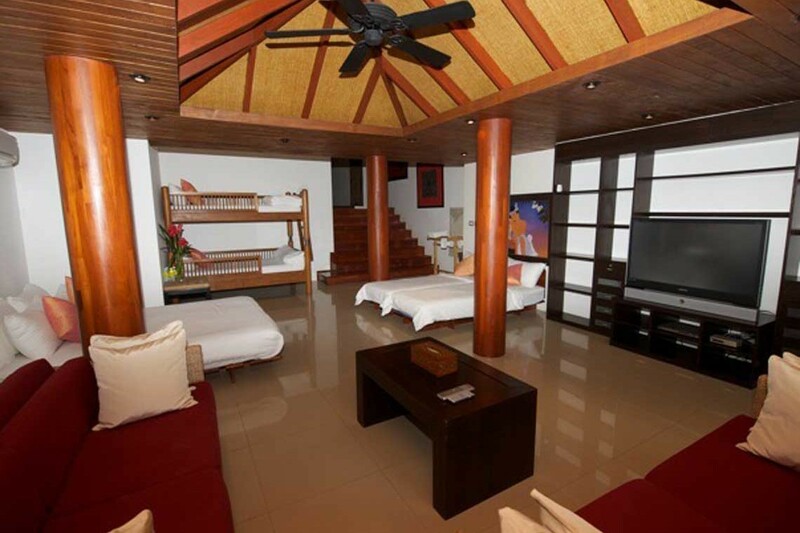 Please note extra transfers are not included in the villa price. The minibus that is used for airport transfers is equipped for 14 passengers, however if your group has a lot of luggage you may need a second vehicle to transport your luggage. 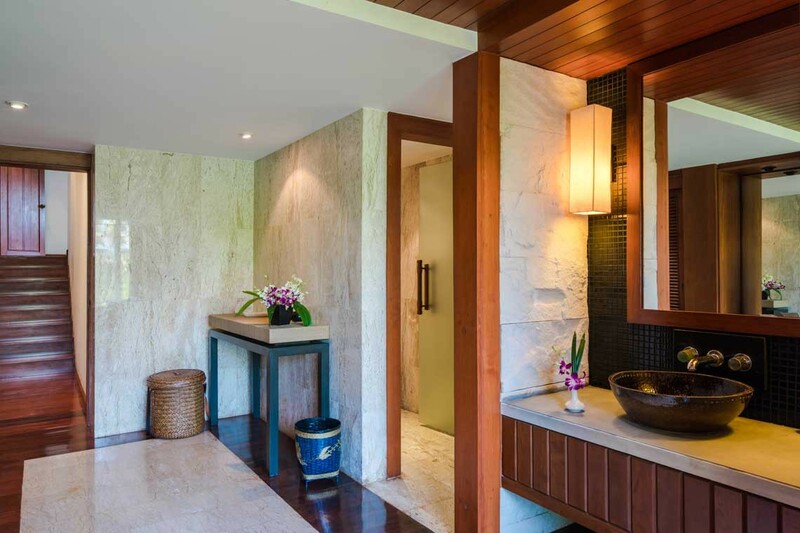 During your stay at the villa, you have the added benefit of utilising the villa's 14 seat minibus to see the sights around Phuket; the minibus comes complete with your very own driver. 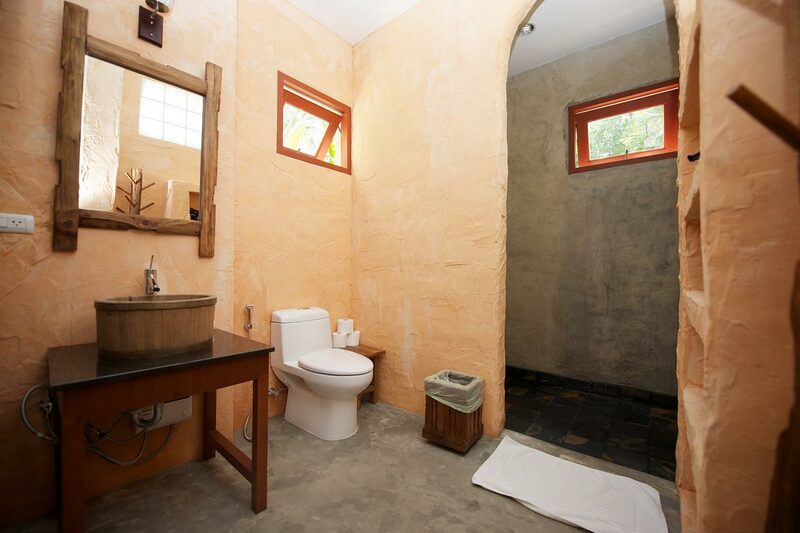 Please Note fuel is not included in the price of the villa. 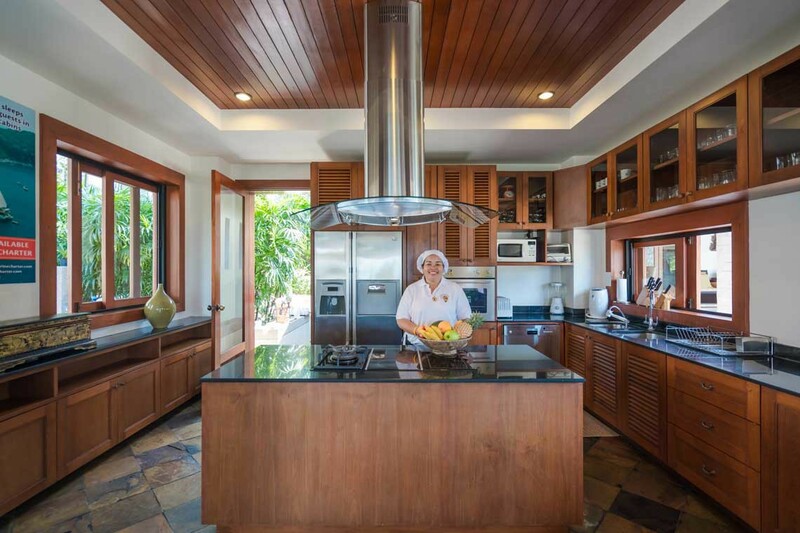 Guests staying at the villa will enjoy a complimentary meal free of charge on arrival, prepared by your very own personal in house chef. 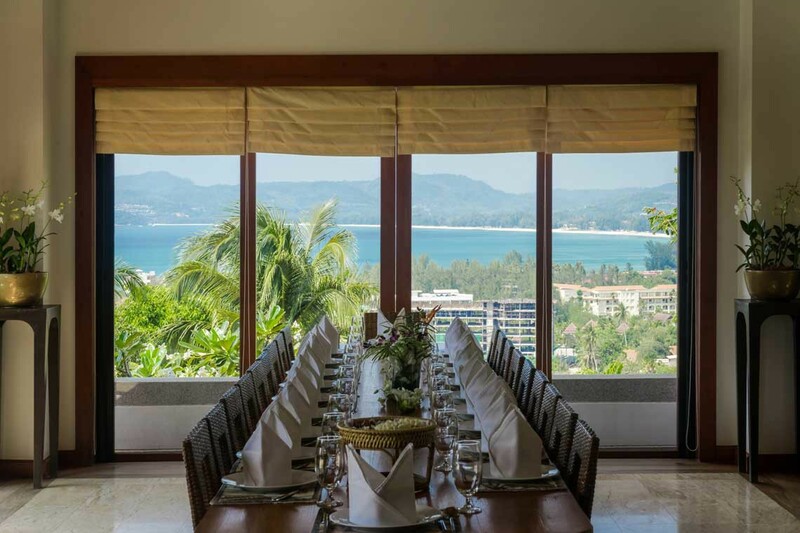 There’s no need to worry about preparing any meals during your stay at Villa Sanyanga as there is a full-time personal chef on hand to prepare delicious Thai and International cuisine. 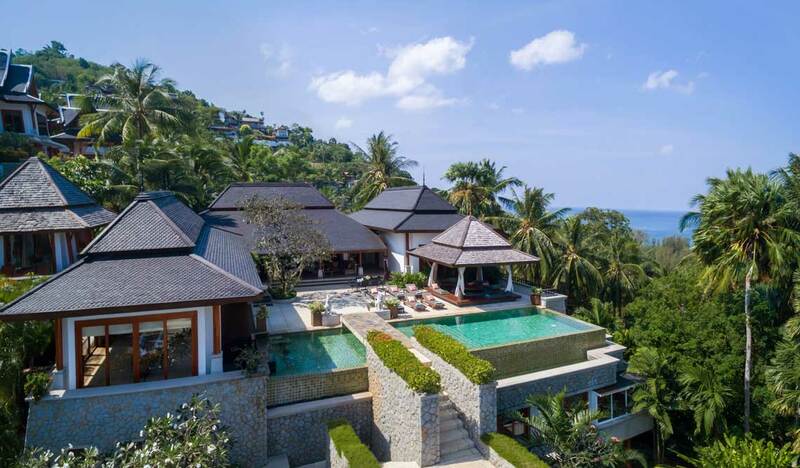 Please Note food and drink are not included in the price of the villa; however one of the villa staff will be happy to take you shopping, or if you prefer they will do the shopping for you. 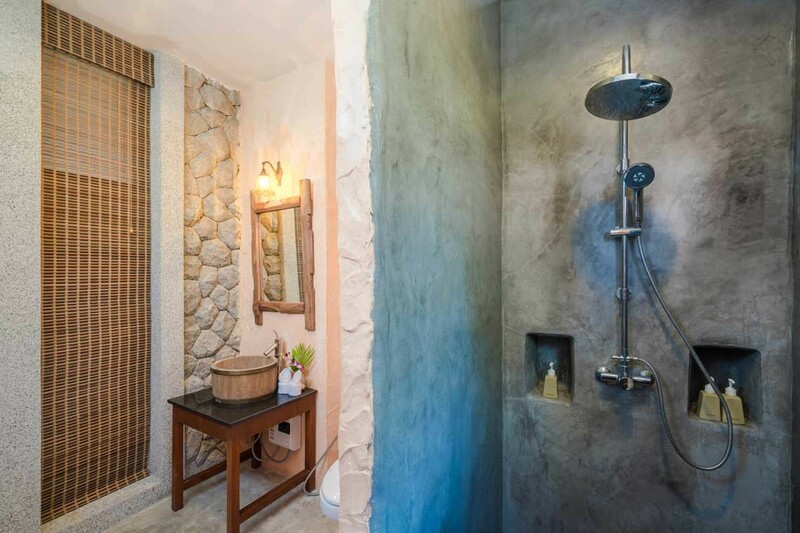 The villa comes complete with two housemaids and a handy man; that will take care of the day to day running of the villa to ensure that your stay is perfect. 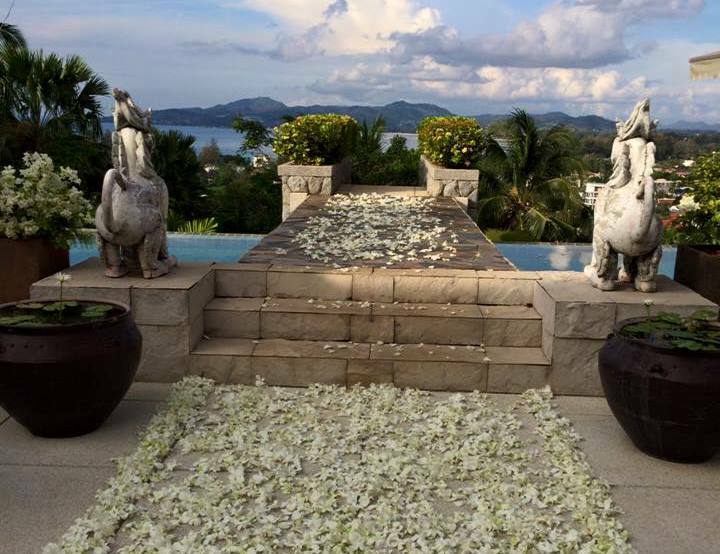 Villa Sanyanga is the ultimate Phuket villa rental for a romantic Villa wedding and honeymoon in Phuket. 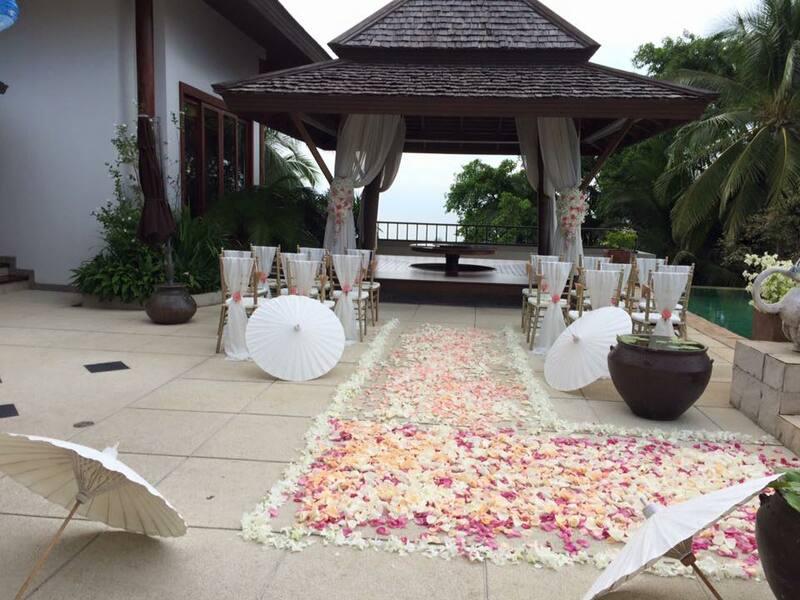 The outdoor terrace and Thai Sala is the perfect setting for your most memorable day, combined this with the fantastic location and luxury accommodation which is available for you and your guests. 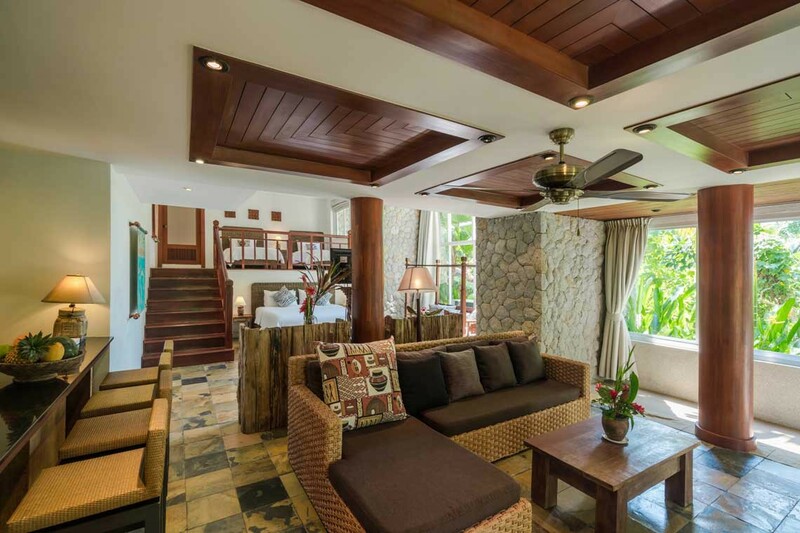 Villa Sanyanga can also arrange half or full day yacht cruises for villa guests on-board their luxury catamaran or day-trip charters on their private speedboat. 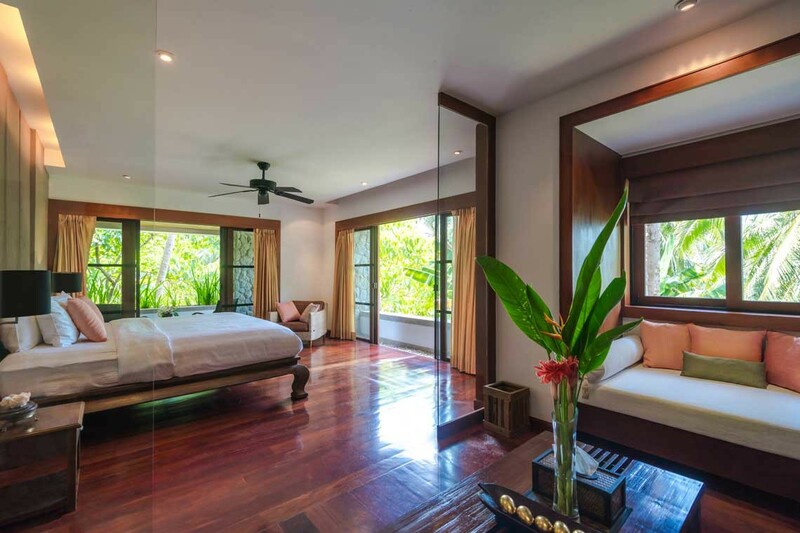 The staff at Villa Sanyanga can organise a masseuse to come to the villa to give guests a relaxing massage or if you would like to do some yoga classes they can also arrange for a yoga teacher to come to the villa. 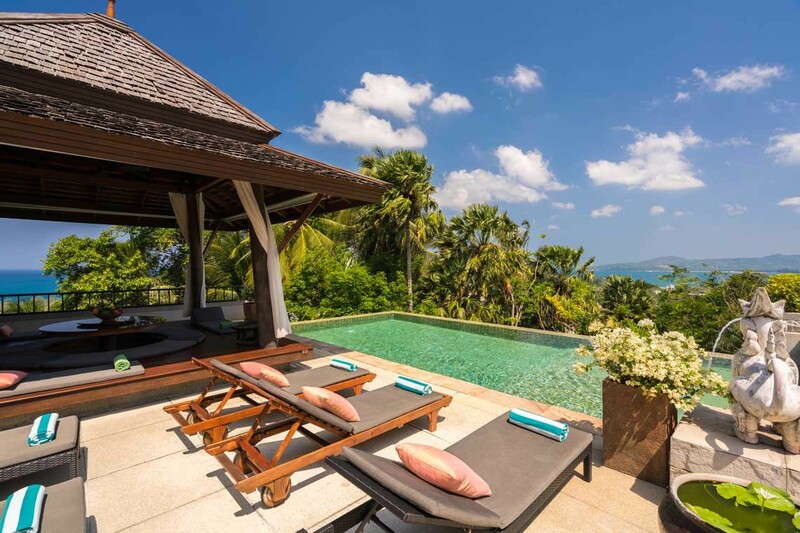 For further information and prices on this luxury Phuket villa rental you can contact the owner of Villa Sanyanga direct by using the contact form below.